After a great summer, we are excited to be getting back into the swing of things this fall. The IBAO Convention is this week, and we hope to see as many local brokers in attendance as possible. It is a great way to network and to keep current with the most pressing issues facing our industry. I hope to see a few of you in Niagara later this week! As a board, we are looking forward to embracing some new initiatives for this Board year. We have added some new faces over the past year, and they have been doing a great job in their new roles. We also have had some recent turnover and we are hoping to add a new board member in the next few weeks who is able to assist in our Social Media presence. Please reach out to Dianne or myself if you are interested! Joanna Mendonca continues to pursue new ideas for YBC events. If you are a young broker, come on out to our next events. IBAWR will be budgeting $2,500 this year towards helping building our YBC presence. We have also been fortunate to have industry partner sponsorships as well – so please come out for some free food and drinks to meet some other young broker professionals. We look forward to seeing an increased turnout to the monthly dinner meetings. We have some interesting speakers lined up for the year and have tried to find topics that can be RIBO accredited. We are also going to announce a new venue for a one-off. We will announce the venue and the month we will take place shortly, so stay tuned… if anyone has any suggestions, please let us know. The AGM is in November, and we are hoping for a better turnout than we have witnessed the past few years. This event does include open-bar cocktails, so please make an appearance! In September Dianne and Kevin Donovan successfully organized another great golf tournament. I wanted to say thank you to each of them for their hard work in setting up that event each year. It is a great time and there were great prizes awarded. Our Christmas meeting is coming up in December. Each year we have a mitten tree for charity. Last year members donated over 150 pairs of mittens, hats and other warm stuff for the winter to kids in need. We would like to try and top that number this year, so please show up, and bring with you an item to donate to the tree – it is for a great cause. If you have any questions or comments about anything, please do not hesitate to reach out to me directly. The IBAWR has had a busy few months and I thought this would be a good time to update our membership about the activities of the IBAWR the past couple of months. I believe we have made some meaningful progress in several key areas that will be relevant as we move forward as a Board. After launching our new website earlier this year, we also proceeded to focus on our Twitter and Facebook pages as a primary means of communicating with our members. We realized that in order to stay on message and maintain a focus on our core mandate, that a Social Media policy was going to be necessary both for our immediate needs, and as a template for future board members to maintain consistency. We have since voted to implement a Social Media policy that will keep our content, simple and focused on material that is relevant to promoting the broker channel and on our community participation. Pat Pearl and Tam Good have both announced their retirement after many years of participation as board members, and I wanted to take the opportunity to thank both of them for their years of dedication to the Board. Darcy Franko-Felice has also stepped down from the Board, as she has decided to pursue a never career path outside of the affiliate territory. Thank you Darcy for donating your time and effort to the Board for the past couple years, we appreciate it! We are excited to announce that we will be adding two new board members to help fill the holes left behind by our departing members. Sydni Felice will be taking over Social Media Committee responsibilities and Richard Zehr will be taking over the Education Committee. Both are young brokers and we are excited to add them to the Board. A big thanks to each of them for volunteering their time. Joanna Mendonca assumed YBC Committee responsibilities in March 2018. Since that time YBC has hosted two of the most successful local YBC events there have been in years. In March, there was a St. Patty’s themed event hosted at McCabe’s in Kitchener. Then, on May 25 another event was hosted at Rustico. Both events had over 20 brokers come out, and both were a great time. Engaging young brokers has been a goal of the Board and Joanna has done a great job in the role so far! As many of you know, one of my goals has been to engage and mobilize our membership for more community and charitable causes. In 2017 we had our first Broker Build day with Habitat for Humanity and with $7,700 in donations raised and 240 hours of labour contributed, we felt it was quite successful! This event exceeded our expectations and we hope that everyone who volunteered and donated had a great time. We appreciate the support and believe that is for a great cause – please check out the pictures on Twitter and Facebook. Our annual Hospitality Night was hosted at Bingeman’s on May 3rd. We had a great turnout, with over 220 members and industry friends attending the event. I wanted to thank Shara Bierman, Dianne Monteiro and Danny Marceau for their hard work to make this event a success. I also wanted to thank all of our vendors for donating prizes and all of our other guests for coming out for a good time! Our next event will not be until our annual Golf Tournament in September, I hope all of our members have a great summer, and we look forward to seeing you in the fall. As many of you have probably noticed, our Board of Directors have been taking steps to modernize how we communicate with our membership. Last Spring, we decided to undertake the process of creating a completely new, and much improved IBAWR website as our central tool that would help us communicate more effectively with our membership and our community. We also made the difficult decision to end the paper format of our monthly bulletin. In its place, however, we proudly launched the new, mobile friendly site in February 2018. We are also taking steps to utilize social media (please ‘Like” us on Facebook, and follow us on Twitter) to engage our membership and the community in new and relevant ways. This transition has not been easy, as it is completely new territory for our Board, however we recognized that to maximize our relevance within our existing membership and to actively encourage new members to join that we needed to embrace change. As part of our commitment to these changes, two of our current Board members (Darcy Franko-Felice and Jason Lawson) together form our newly created committee for Social Media and Public Relations. Our goal is that establishing this committee will ensure the Board’s commitment to embracing social media and other evolving communication mediums. While we continue to advocate on behalf of our members and on the benefits of the broker channel, I believe that one of the best ways to help ourselves as IBAWR members is by continuing to find new ways to be visible and generous community partners within our Region. We are very fortunate to have a large and engaged group of members and loyal industry friends. I believe that mobilizing our membership to give back to our community can make a positive impact for a variety of great, local causes and also strengthen the relationships within our own membership, as well as reinforce to the public that IBAWR members are integral partners in our community. With that being said, we hope this year to have an even more successful Habitat for Humanity Build Event. Last year we were able to raise $7,700 towards Habitat for Humanity, and we also contributed 240 hours of actual physical participation at the build site! It was a great turnout of support. We believe that we can we exceed both of those figures this year. We will be sending out formal details for this year’s event later this month. Lastly, I wanted to thank both Scott Heaman (now our Past President) and Mary Riberdy for their contributions to the IBAWR that have helped get us to where we are. IBAWR will be participating in the 2018 Habitat for Humanity Build Event on May 22nd and 23rd, 2018. For further information regarding the event, participation, and donations, please click here. 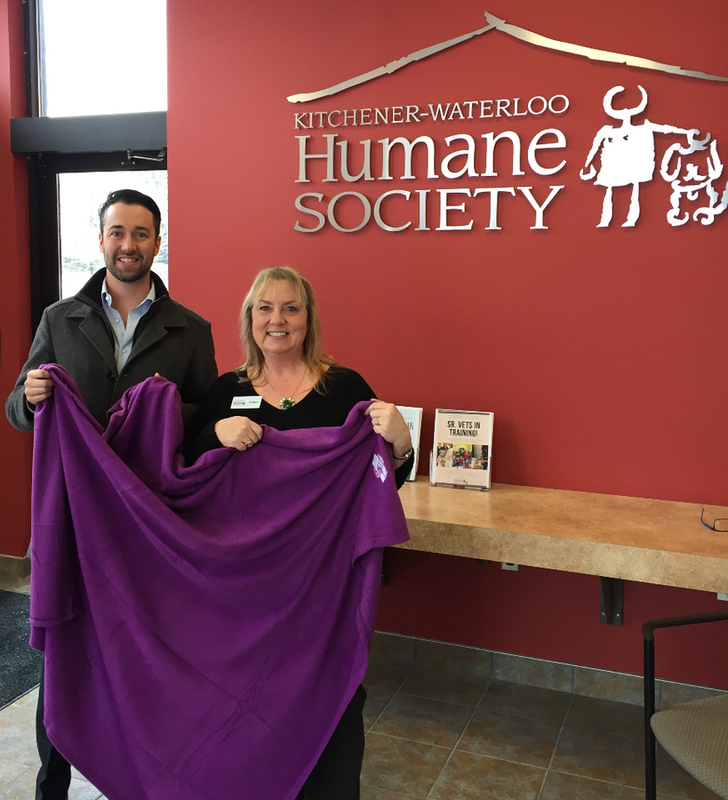 This March, the IBAWR donated 40 Bipper Blankets to the KW Humane Society to help keep the animals warm this winter!